Right from when our children are babies, we introduce them to games that help develop their literacy and thinking skills. From peekaboo and tickle games to finger plays, the rhymes and chants we share help them internalize language. I'm not sure that's the main reason we do it though. The fact is, babies love to play, and they have fun with these activities, so we do them over and over again for the baby's delight. As kids get older, as we chat to them and keep sharing wonderful books and rhymes, their language acquisition grows. They begin to talk, memorize, repeat and play with language. They seem to have an inbuilt radar for the joy words can bring, and they love to listen to songs, rhymes and learn games with actions. Although children this age aren't reading or writing, they are acquiring the skills they need to be able to read and write. They are unconsciously picking up all sorts of things about the rhythm of natural speech, about the rhythm of poetry and song, about rhyme, about tone, about sequencing. When kids get together, in a playground or on the corner block, they play. Some of those games involve language - choosing It with a counting-in rhyme like Eeny Meeny Miny Mo - and some don't, but all games are important. As Carol Rasco from RIF reminded me recently, "Play is children's work". By playing real-life games, kids learn about co-operation, about sharing and taking turns, about following rules - and all while being outside in the fresh air! Recently, I became concerned that some of the games, particularly the skipping and clapping chants and rhymes, are not as prevalent as they used to be. I know there are many kids who enjoy them, or would enjoy them if they had access to them, so I decided to search for, and publish some. I put out a call to some friends in the blogosphere for favourite playground games, and was delighted to find that many people remember them with both enjoyment and accuracy. Brian Frank from Book Dads makes a great point with his suggestion of a playground game, Rabbit and the Dogs, (described below by Brian). Sometimes the best games are ones that allow every kid to have a turn in the limelight! This game is like playing Tag in reverse. Instead of one player being chosen as It, one player is chosen as the Rabbit. Their job is to run away and not get caught. The remaining players are the Dogs, and their job is to chase the Rabbit until one of them catches the Rabbit. That Dog then becomes the new Rabbit, the former rabbit becomes one of the Dogs, and the chase resumes. My geeky, book-loving friends and I learned to love playing Rabbit and the Dogs in middle school because none of us was very good at being It when playing Tag. Rabbit and the Dogs levels the field among all the players: a poor Rabbit will get caught quickly but even a good Rabbit will get caught once the dogs gang up on him. So no one gets stuck being It forever, and the game changes so quickly that everyone gets a turn. This makes it especially good for kids of varying skill levels or ages. Brian suggests we take a look at this post about turning video games into outdoor games. Great idea! Claire Saxby from Let's Have Words loved the opportunity to wander down memory lane. Claire's favourite playground game was elastics. Kids start with a loop of elastic, maybe two metres long, and 1cm wide (6 feet by 1/2 inch). Usually, two people get inside the loop and hold it apart with their bodies, while another person jumps different ways involving the elastic. Some kids use rubber bands joined together to make their loop. Claire remembers elastics as "progressive with the elastic getting higher and higher until it could be shoulder/neck high. Two people would stand about 4-5 feet apart with an elastic loop around their ankles. The third person would then jump in, out, crossover the elastics. If they could do it successfully they progressed to a higher height of the elastic loop or a more complex series of steps." 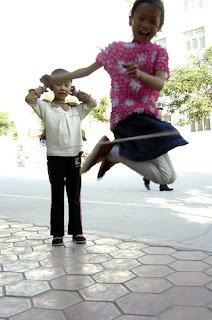 Carrie Anne from Another day, Another thought or two blog remembers elastics too, only she calls it Chinese jumprope. Karen Mikolainis from Mommy's Favourite Children's Books loved it too. Carrie Anne sent a link to some excellent directions at ehow, and says, "The Chinese jump rope game I remember, and the one I taught my daughter, was Mississippi. You jump the rope while spelling the letters. I actually attribute this game solely for my ability to spell Mississippi (and Mississauga, a city not far from here). Every time I need to spell it, the rhythm of the skipping song goes through my head M-I-SS-I-SS-I-PP-I." "The jumper spells out Mississippi as she jumps. With M, jump into the center. With I, jump both feet outside of both ropes. With S, jump to straddle the left side of the rope. With the next S, straddle the right side of the rope. With I, jump both feet outside again. With the double SS, repeat the same S jumps. With I, outside both ropes again. With PP, step on both sides of the rope with a double jump. Finish with I by jumping outside both ropes again. Move the ropes up the body as the jumper successfully finishes a jump round." You can find more detailed directions online, with some chants to accompany them. I found a great Australian site, Skipping Pebbles, that sells pretty elastics, and provides rhymes and directions too. Valerie Bartz remembers Four Square as her favourite playground game. Valerie, from The Almost Librarian, says "This game ruled my elementary school for a staggering number of years. We had several Four Square grids painted on the playground blacktop permanently and then we also had several more mapped out with tape on the gymnasium floor for rainy days. Anybody could play. I don't remember leaving kids out for being too young. However, you had to be good or you'd be out immediately. And also if I remember, when the bell rang, you'd take note as to who was positioned where and then you'd pick that game right back up at the next recess. What's great about this game is that it involves a lot of people - it's good to have a line of folks waiting for their turn to enter box number 1 because play moves pretty quickly. And it's also a good game because you only need chalk and one bouncy ball to get it up and going." You can find directions for Four Square at ehow, and at squarefour. This game also gets the thumbs up from Kelly Curtis at Pass the Torch, and Terry Doherty from Scrub-A-Dub-Tub. I hope your kids enjoy reading and playing these games. Watch out for more Literacy in the Playground over the coming weeks, when we will focus on skipping and clapping chants, as well as singing games. Don't you love it when literacy and fun go hand in hand?